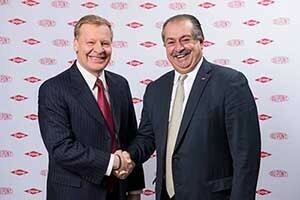 Edward Breen (left), chairman and CEO of DuPont, and Andrew Liveris, president chairman and CEO of Dow, in December 2015. This weekend, news broke that BASF SE, parent company of BASF Pest Control Solutions, is looking to counterbid on the $130 billion merger plans of DuPont and Dow Chemical. That deal has been in the works since December. At press time, no formal approach has been made to DuPont, but the news is making headlines in the financial media.